This book is going to do away with the negative stigma associated with the word cancer: cancer doesn’t mean death, pain or suffering. It will give you hope: that’s why it has such a friendly, uplifting appearance. It’ll draw a smile from everyone who reads it right from the first page. Here, people depressed or nervous about chemotherapy will find something to lift their spirits. Some pages only serve to be torn out to provide an outlet for your anger, others to be scribbled on, hard, while others can be coloured in to relax you and offer you the inspiration you need to get through every day. 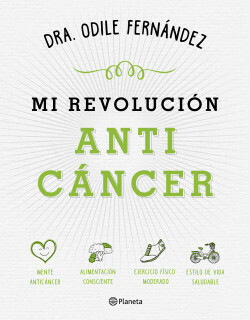 My Anticancer Revolution is unique and practical. It is a mixture of a self-help and activity book, but it was written with scientific rigour. A moving book full of positivity and good advice for dealing with cancer. Belgium (ZNU) and Portugal (Planeta Manuscrito).